Near to the area now known as Carr Vale a small colliery was sunk during the late nineteenth century and affectionately known by locals as 'Batties Main', corruption of the name Bathurst which was situated to the south of the later Lancashire, Derbyshire and East Coast Railway tunnel between Carr Vale and Scarcliffe, on Darwood Lane, Spittal Green, overlooking the village. Bathurst Main colliery mined coal on land belonging to Earl Bathurst or Lord Byron of Cirencester Park Gloucestershire who purchased the manors of Palterton and Scarcliffe in the middle of the eighteenth century from the Aspley family. It was on this original site that the clays were mined from a small footrel. The colliery worked from two small seams of coal, the Wales and Highmain seams. Sometimes called the Upper Silkstone or Silkstone seams. The colliery worked small scale here until around 1891 (According to. Geology of the Country Around Chesterfield, Matlock and Mansfield. Smith, Rhys and Eden. H.M.S.O.) When work from the early adits and the later shaft ceased officially. Unofficially however the colliery allegedly 'worked' during the miner’s strikes of the twentieth century culminating in production during the 1972 strike when coal was wound to the surface using an overturned motorcycle as a winding engine. You can appreciate the small scale of the coal mining operations when you realise that the Highmain seam is only twenty three inches thick and the Wales seam between eleven and sixteen inches thick as they run from Carr Vale to Palterton. It was Earl Bathurst along with other local landowners who sought to exploit mineral reserves on their estates but I think they may have been a little disappointed with the coal reserves here. 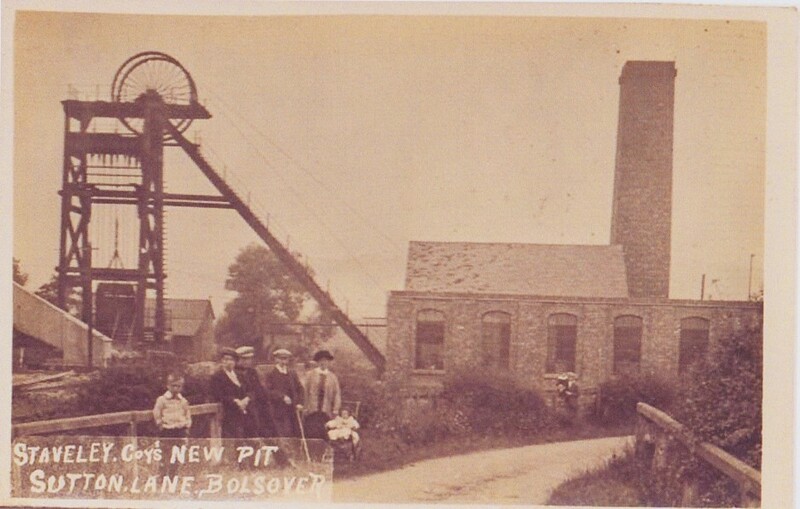 Near to the colliery site a borehole was drilled one hundred and forty feet into the measures below the Highmain coal seam and a water treatment plant was set up for Bolsover Council as the borehole yielded between four and eight thousand gallons of water per hour. The water was then treated with lime and pumped up to Bolsover to supply the area. It was possibly still in use during the 1960's. According to later reports the colliery was in use as late as 1896 when the brickworks were to be sold at auction as a going concern. This raises the question were there two collieries in the vicinity? Were the two adits a later colliery and the single shaft an earlier colliery? The single shaft method of mining was outlawed in 1862 after the Hartley colliery disaster. Or could it be that both adits and the shaft formed one mine? 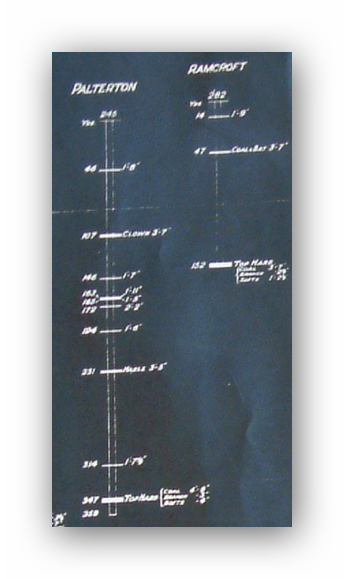 A lease was taken out for the mine in 1885 (31/12/1885) from Lord Byron for forty years at a cost of £100 this included the Clowne seam which lays at a depth of 497 feet from the surface and is around three feet nine inches thick and another seam which is eleven yards above it. (This second seam is only seven inches thick as the Swinton Pottery Coal). Not really a viable proposition one would think. The lease provided for 257 acres of coal. The mined coal was transported from the colliery to the brick works by fifty chains of haulage rope powered by a 14 horsepower horizontal haulage engine. Information from Abandonment plans of 1893. Leased to: William Arkwright, Sutton Scarsdale. Two small seams of coal run from Palterton to Carr Vale the Wales and Highmain and it may have been exploratory sinking to exploit these seams that opened up the colliery. 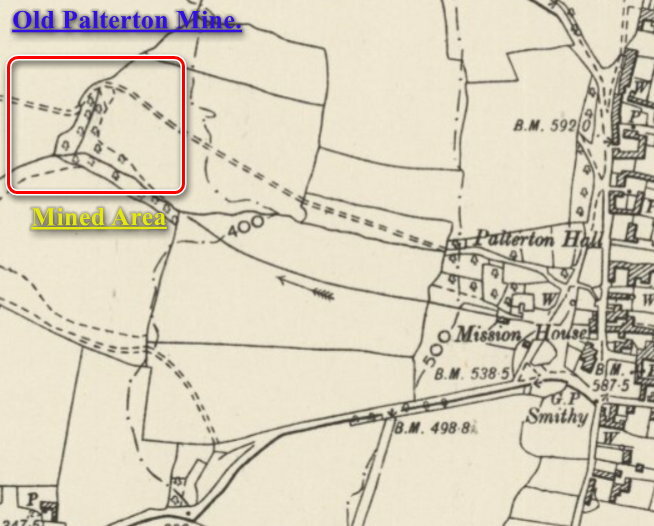 The Palterton miners are referred to in 1911 but any other documentation is unavailable but note the colliery type housing built by the Staveley or Sheepbridge Company in Palterton village. Plans show two shafts and some other surface workings nearby. 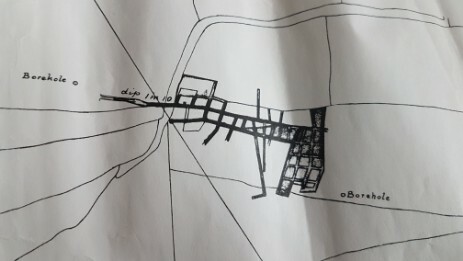 The presence of the two shafts should indicate that the colliery is later than 1850 or that it is two separate workings from earlier, which is much more likely. 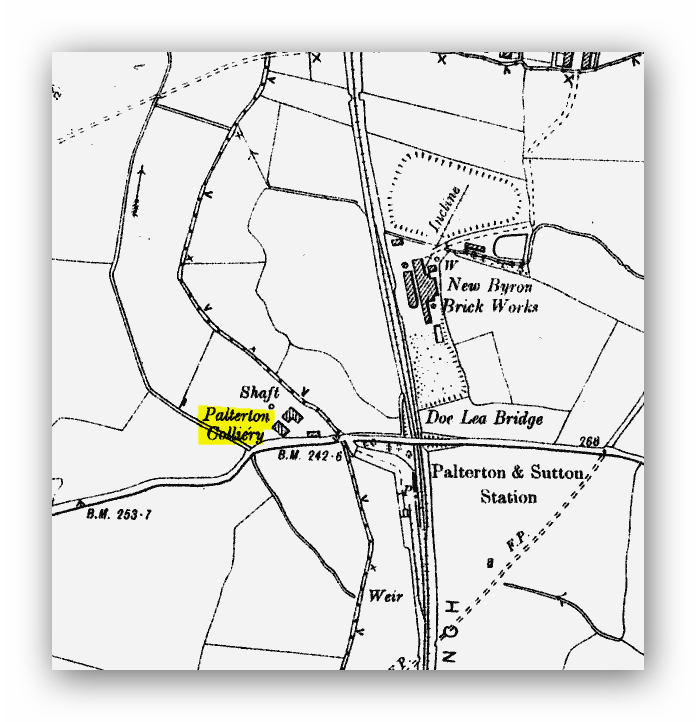 However John Farey writing in his 1811 book refers to 'a colliery at Palterton which is just west of the houses or 1 1/4mile ssw of Bolsover,' but is logged as 'formerly worked' here, meaning that by 1811 the colliery or workings are no longer in use. Farey also writes in 1811 on p167 of ‘General View of the Agriculture and Minerals of Derbyshire vol 1. 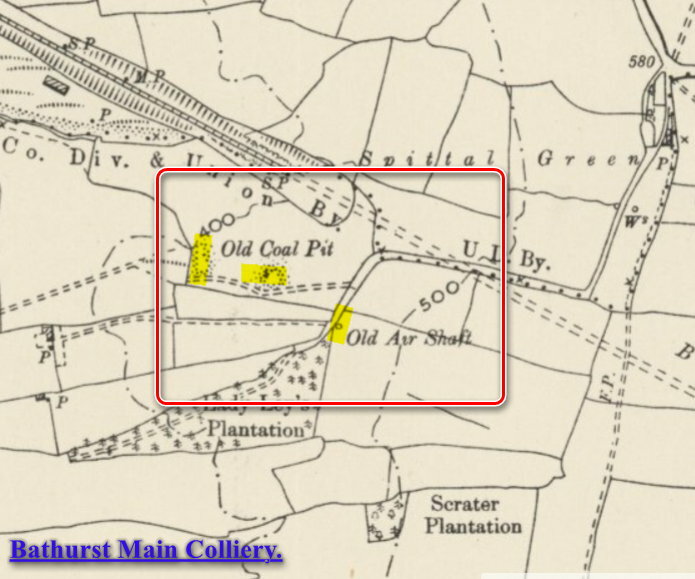 At Palterton, Shuttlewood-Common, and Stanfrey, coals have been worked in these measures from under yellow lime, and are now so working west of Clowne. Referring to mining coal under limestone strata. 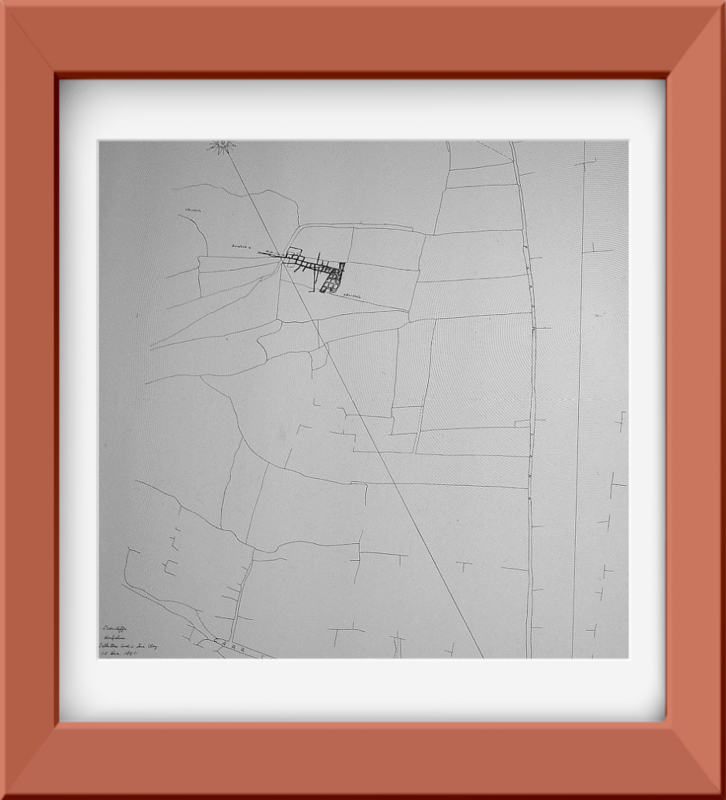 He also notes on page 396 that at Carr in Palterton he observed the slag and remains of old bloomeries and charcoal furnaces. This is the remains of iron smelting and or its processes in an area nearby. 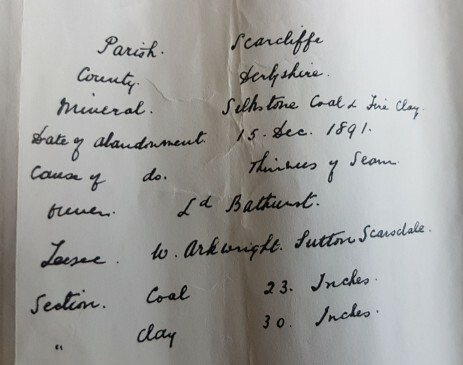 So there is much evidence of coal and ironstone mining in the Palterton area on the escarpment side, as at this time (18th century or before). Coal mined here by two shafts and an adit or drift, SK. 468 685. This may or may not have been excavated by locals during the miners strikes of the 1970's and 1980's. 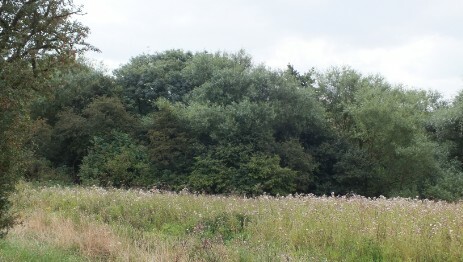 This colliery or other collieries are not to be confused with the Palterton Air Shaft or Markham number five as below. Left image shows where the adit coal was mined. SK. 468 685. This may or may not have been excavated by locals during the miners strikes of the 1970's and 1980's. 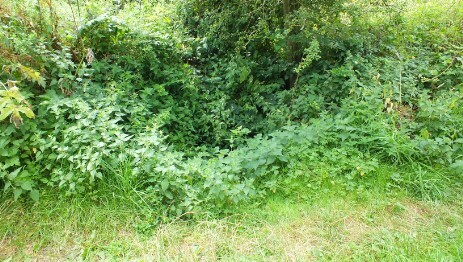 Right image shows the general appearance of the site. Adit left, shafts right.